Robert (Bob) A. Tuma, Jr. passed away Dec. 24, 2018. His death was due to Alzheimer’s disease. His passing was peaceful at home with his family by his side. Bob was born in Washington, DC in 1931 to Flora and Robert Tuma. The family moved to Minneapolis, MN in 1934. Bob attended elementary school at the Basilica Parish then graduated from West High School. He played football, basketball and excelled in tennis. He was highly intelligent. He joined the Air Force where he applied for a transfer to the Monterey Language School. After learning the Russian language they transferred him to East Berlin where he decoded messages for the military. His free time was spent traveling and learning the German Language. After an honorable discharge he graduated in 2 years from St. John’s University, in Collegeville, MN with an Economics Degree. He later received his MBA from the University of Minnesota. Bob met his wife, Joan Nelson, at a wedding of a mutual friend. They were married August 24, 1957. They moved to Highland Lakes, NJ where Bob took a position as International Flour Broker for the Pillsbury Company in NYC. At one point while working in Saudi Arabia his passport was taken and he was held for 2 weeks before they admitted they had a fraudulent claim against him. He continued his work for Pillsbury. He spent 3 years in NY, 5 years in Minneapolis, and 2 years in Los Angeles before moving to Goleta, CA in 1966. There, a 2 year position at Applied Magnetics was short due to the closing of the company. 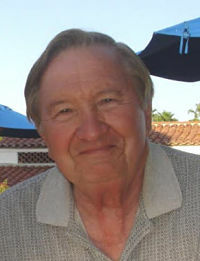 He continued his work in data processing with Hughes Aircraft and Southern California Edison, commuting to Los Angeles, before taking a position as data processing manager with the Santa Barbara County Schools, retiring in 2000. Bob’s highest priority was family. He was a strong man. He loved music, dancing and always had a funny story to share. His loud laugh was contagious. He stood for honesty, integrity, and equality for all people. He was always there to help a stranger in need. He is survived by his loving wife of 62 years, Joan, and their four children; Beth Tuma – Thomas and husband Dave, Rob Tuma, Jayne Tuma – Yee and husband Randy, Alison Tuma and two grandchildren, Dillan and Kendall Yee. He is preceded in death by his parents, Flora and Robert Tuma. Thank you to our wonderful caregivers: Rosa, Elva, Vilma, Enrique, Lorena, Aldo and Lidia. In lieu of flowers donations can be made to Alzheimer’s Research, Visiting Nurses Hospice, or a charity of your choosing. All are welcome for a Celebration Of Life service held Saturday, Jan 19th 10:00am at St. Raphael Catholic church, 5444 Hollister Ave, Santa Barbara, CA 93111 with a reception to follow in the parish hall. Visitation/Rosary will be held Friday Jan 18th 6:00pm at Welch-Ryce-Haider Goleta, 450 Ward Dr, Santa Barbara, CA 93111.